After achieving international success and an Oscar with A Separation (Jodaeiye Nader az Simin, 2011), Iranian filmmaker Asghar Farhadi undertook the bold move of making a film outside his native Iran and in a language that was not his own. Farhadi’s The Past (Le Passé, 2013) is set in Paris and in French, but his singular dramatic style was unattenuated by these shifts. The film was nominated for the Palme d’Or, and its female lead, Bérénice Bejo, won the Best Actress Award at the 2013 Cannes Film Festival. The film continues with Farhadi’s focus on the difficulties that marital relationships have in modern society when the two partners have conflicting interests, as was the case with his three preceding works: Fireworks Wednesday (Chaharshanbe Suri, 2006), About Elly (Darbarye Elly, 2009), and the aforementioned A Separation (2011). But actually, what makes Farhadi’s films interesting is not just the issue of marital harmony, but a more fundamental and underlying theme: how can we achieve a shared understanding of what is true. We often have the sometimes naive faith that there is a single objective truth towards which we can all converge. This can be the case when we observe the natural world with scientifically verified measuring devices. But in the complex affairs of human engagement, the observer can have great difficulty arriving at any form of truly objective truth. In these circumstances there is often a complex mixture of causal agents, each with unarticulated goals and histories. In attempts to explain what has happened, everyone may have their own slightly different version of just what did happen and what were the underlying causes of those events. So telling the objective truth may not be feasible. Moreover and given these circumstances, we may need to modify or edit what we think is true in accordance with the social context. This was the major theme of Farhadi’s masterpiece (to date) About Elly, and he continues exploring issues along these line in The Past. There is another, closely related, theme covered in the film and that concerns the shifting degrees of authority – one can almost say, “territoriality” – that take place in modern life. With modern familial relations so complicated, the determination of who is truth’s arbiter (particularly towards children) in those circumstance can be difficult. Writer-director Farhadi fashions a plot for this film that brings all these issues to the fore. The story of The Past covers a period of a few days and concerns the visit of an Iranian man who has returned from Tehran back to Paris after an absence of four years so that he can finalize a divorce from his French wife. As with Farhadi’s other films, the narrative device of slow disclosure is used to tell the story, and the viewer must gradually piece together various scraps of information in order to discern the relationships and issues. Thus the viewer is all the way, just like all the characters in the film, trying to establish what is true. Although at the film’s outset the wife is shown cordially greeting her estranged husband at the airport, the viewer soon learns that their relationship somehow fell apart four years ago. Even in the car on the way home, they start needling each other and getting under each others’ skins. There are seven principal characters in the story, and after awhile one learns how they are related. Ahmad (played by Ali Mosaffa) is the Iranian husband who has returned to Paris for a visit after four years. Marie-Anne Brisson (Bérénice Bejo) is his estranged wife, who is the mother of two children fathered by husbands previous to Ahmad. She works in a Paris pharmacy and lives with her two daughters in a house she once shared with Ahmad about ten miles outside the city. Lucie (Pauline Burlet) is Marie’s 16-year-old daughter. Samir (Tahar Rahim) is a French Arab and Marie’s current lover. He runs a dry-cleaning shop in Paris within walking distance of Marie’s pharmacy, and he has a flat above the shop. Fouad (Elyes Aguis) is Samir’s 6-year-old son. Naïma (Sabrina Ouazani) is a French Arab woman who works in Samir’s dry-cleaning shop. As the story unfolds Ahmad is seen to be the person who believes most in open honesty. He evidently has faith in the idea that a shared truth can be established if we just tell everyone what we know. But his policy of sharing what he has heard only causes problems. The two little children, Lea and Fouad, do not have seemingly important roles, but they are spectators, like the film’s viewers, who are trying to make sense of the agonizing adults around them. They are also just about the only ones in the film who ever smile; the rest of the characters seem to be uniformly unhappy with their lives. This, in fact, points to one of the weaknesses of the film – the unrelentingly bad tempers of the principal characters, which casts a pall over the story that is only relieved occasionally by the appearance of the little kids. The narrative structure can be seen as partitioned into three phases. In the first phase, the viewer is introduced to Ahmad, Marie, and Samir. At the start, Ahmad and Marie meet at the airport, and Marie takes Ahmad back to her home. Marie tells Ahmad that her daughter Lucie has been “giving her hell for the past two months”, and asks Ahmad to see if he can find out why. Although Marie and Ahmad are quick to bicker with each other, there appears to be unresolved issues and still some tentative interest between them. Any thoughts of restoring the relationship, however, are soon squashed when Ahmad discovers that Samir and his son Fouad have moved in with Marie at the house, a fact that makes Ahmad noticeably uncomfortable. Soon, while Samir is away from the home, Fouad misbehaves, and we see how differently Marie and Ahmad attempt to deal with the impudent boy. While Marie is short-tempered and punitive, Ahmad tries gently to reason with the boy. Later Marie goes to the dry-cleaners to meet Samir, and it is clear that Samir is very uneasy about Marie’s former husband staying in the home (he had thought Ahmad would be put up at a hotel for his short visit to take care of the civil divorce proceedings). In fact the tension between Marie and Samir is palpable at this point, and the prickly-tempered Marie scolds him by saying, “you can’t say whatever you want and then apologize”. This is just one of many examples where people interpret what has been said in a negative way. Marie then goes to work at her pharmacy. Meanwhile Ahmad at home reacquaints himself with Marie’s two daughters. He learns from the older daughter, Lucie, that Samir is already married to a woman, Celine, but that she is currently comatose in a hospital. The reasons for why she is in a coma will be a major concern the rest of the way. All we know is that Lucie is disturbed by the situation, and she holds Samir to blame and despises him. In addition she suffers over the idea of her mother having new lovers all the time, and she complains, “since I was born my mom has changed guys three times” (one of those “guys”, of course, was Ahmad, himself). Then in the final part of this first phase of the film, Ahmad and Marie go to the court the next day to take care of their divorce. The second phase of the narrative shifts its focus and is centered around Lucie and her desire to run away from home. Ahmad is the only person she will talk to, and so he tries to spend some time with her to straighten things out. Lucie reveals that Samir’s wife Celine is in a coma because she attempted suicide, and moreover, Lucie is sure that this came about because Celine was jealous about Samir’s affair with Marie. Ahmad, who believes that airing everything out in the open is the best solution and that nothing should be kept hidden, tells Marie about Lucie’s suspicions. Upon hearing this accusation, though, the volatile Marie goes ballistic and physically throttles her own daughter in anger. The narrative focus shifts again in the third phase of the plot, this time to Samir, who has been largely a background character up to this point. 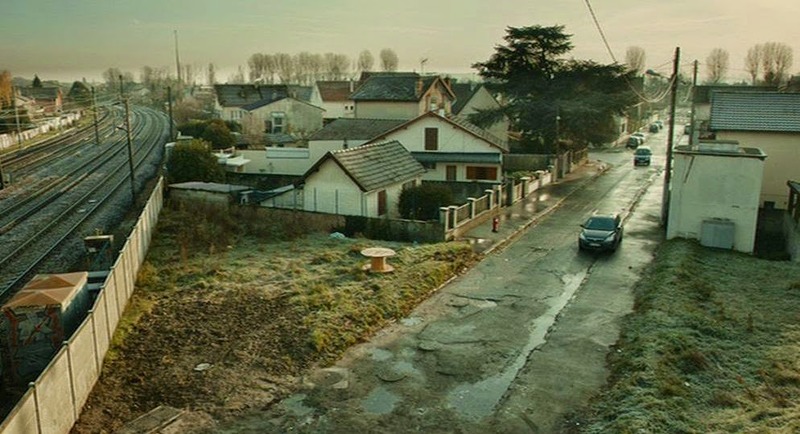 We learn that there is an alternative possible explanation to account for Celine’s attempted suicide that involves the dry-cleaning assistant Naïma, and Samir holds on to this possibility. But in the end, the true explanation of what lay behind Celine’s act – an explanation of the past – proves to be elusive. All we know is the present: that Celine remains in a permanent vegetative state, and that the lives of the others in this story are very gloomy indeed. At the end the viewer, as well as these characters, themselves, are left with the problem of determining the causal responsibilities, which remain obscure. It's a fascinating concoction, but there are a couple of elements in The Past that detract from its best possible realization. One, as already mentioned, concerns the persistent bad tempers of the characters. Everyone, except the two little kids, is in a very unhappy state, and the relentless bickering can be wearing. This was also a problem that afflicted the earlier Fireworks Wednesday, and Farhadi has fallen back into it here. Once we learn the first three items, we can calibrate when the relationship between Marie and Lucie finally broke down (2 months ago – though we also eventually learn that as far as Lucie was concerned, her relationship with Marie had broken down much earlier, at least 8 months ago). In this connection Farhadi’s use of slow disclosure presents another problem. I have compared Farhadi’s cinematic style to that of Michelangelo Antonioni  before, but in this instance we can mark a difference. Both directors feature complex ensemble acting involving characters who are struggling to establish meaningful relationships. But whereas in Antonioni’s work we “get inside” his principal characters and empathize with them, here in The Past it is difficult to do that because of the way Farhadi has concealed from his audience important aspects of what his characters are thinking. Of course, this is part of Farhadi’s scheme, since figuring out what people are thinking is an important aspect of The Past. But it does make it more difficult for the viewer to empathize with his characters. There are other aspects of The Past, however, that more than make up for those detractions. The acting in the film is outstanding. Each character is well-realized, and they all play together beautifully in spontaneous, natural interactions. Bérénice Bejo won a Cannes Film Festival acting award, but the others are equally meritorious. In particular, the performances of the two little kids are amazing, especially that of Elyes Aguis in the role of Fouad. I don’t think I can recall a young child giving a better performance on film. The cinematography is also excellent. There are complex interactive scenes with multiple characters, but Farhadi’s camera work is fluid and natural throughout. He has finally discarded the use of a shaky hand-held camera to convey agitation, and that is a big plus in this film. Lucie feels guilt and anguish about the past in connection with her own malicious act of telling what she believes to be the truth. Naïma wanted to free herself from suspicion about the past by telling a lie. Marie wants to cut all her ties with the past. She wants to forget the past and the people associated with it completely and start over. “I want to explain why I didn’t . . . “. But Marie cuts him off and says she’s not interested. She just wants to forget the past. Samir, the person on whom the camera closes at the end of the film, cannot let go of the past. The past is still present for him. Those closing camera shots of the film are particularly notable, and they leave a lasting effect on the viewer. The second to the last shot in the film is a one-minute-long tracking shot following Samir around in the hospital. This is followed by a single, extraordinary shot lasting five minutes and thirty second that tracks the movements of Samir that close the film. By slowing down the pace of the film in this way, Farhadi has extracted us from the past and brought us into Samir’s agonizingly interminable and inescapable present. “About Elly”, The Film Sufi, 15 April 2012.